Following his altitude record for series vehicles [www.touareg-record.com], Rainer Zietlow is now on the point of starting another automotive world record project: the EcoFuel World Tour. 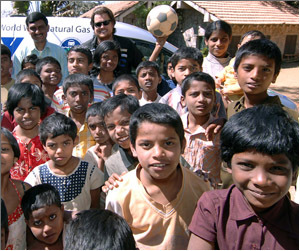 The goal is to drive around the world in a Volkswagen Caddy EcoFuel running on natural gas. With a look at the automotive future, the intention of Rainer Zietlow and his expedition team is to show that this alternative fuel concept is a feasible and globally available technology. This journey around the world, the ultimate test for vehicles, is thus meant to prove that natural gas as a fuel constitutes a full substitute and ecological alternative for petrol and diesel. During a six-month period, the team will drive a distance of 45,000 kilometres across five continents. The record tour starts on 23rd October 2006 in Hanover and will take the team to 75 metropolises in 40 countries all over the world. The EcoFuel World Tour will officially be finished on 13th April 2007, the Press Day at the AMI trade fair in Leipzig, the motor show for Central Europe. For every driven kilometre, Rainer Zietlow's team will make a donation of 10 Cent to the SOS Children’s Village in Banglaore/India. The international SOS Children's Village organisation has made it its business to help children wherever they might need help and care. Rainer Zietlow and his team want to drive their natural gas vehicle through the largest number of countries on five continents without interrupting the tour or returning to the country where they set out on their journey. The Volkswagen Caddy EcoFuel’s 13-litre tank will be sealed on 25th October in order to ensure that the vehicle can only be driven with natural gas.